I’m going back to rewatch some of the first Rajesh Khanna films I ever got. He is one of the first actors from the older generation that I became interested in, after I saw him in the inimitable Disco Dancer and thought him very charming (especially in contrast to the dreadful Sam and Mr. Oberoi and unbearable Mama’s boy Jimmy). He didn’t maintain my interest at the time, possibly because there was so much else to distract me (Shammi! Pran! Helen! ), but I’m so glad I’ve rediscovered him. 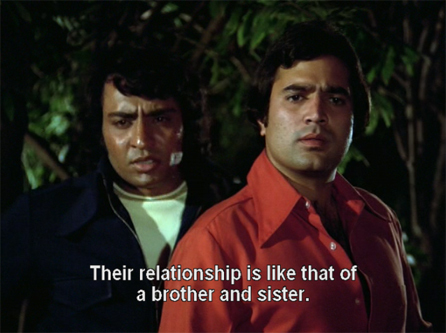 Aap Ki Kasam is a very emotional story which alternately enraged me and then made me cheer, and it isn’t one of those “happily ever after” films you sort of expect from 70s Bollywood. It highlights several of Rajesh Khanna’s finer qualities: he picked unusual films and scripts—with unusual roles for a “hero”—and he didn’t mind sharing screen space with equally adept actors like Sanjeev Kumar. 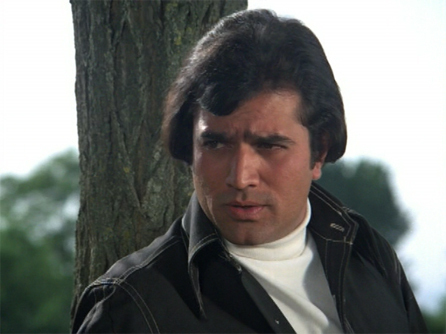 Kamal (Rajesh Khanna) is a senior student who is very serious about his studies, and doesn’t socialize much. He is from a village hours away, where his father has a farm. He meets Sunita (Mumtaz), the daughter of a rich city barrister, through a misunderstanding. When it’s cleared up, an intense romance develops. The screen fairly sizzles sometimes in scenes between these two! Their respective families approve, and Kamal finds a job and a house with the help of his long-time close friend Mohan (Sanjeev Kumar). 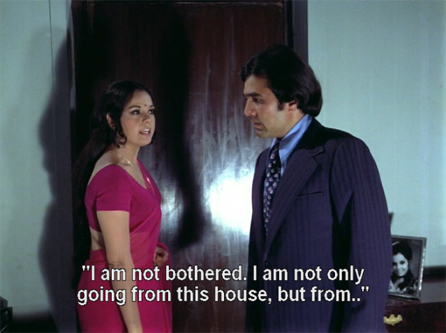 Mohan lives in the house next door with his estranged wife (his was an arranged marriage, and they can’t stand each other, sadly) and his servant Kanhaiyalal (Keshto Mukherjee at his drunken best). Kamal and Sunita are married and settle into their new home and their life together like the deliriously happy newlyweds they are. Mohan, being unhappy with his home life and thrilled to have his close friend nearby, soon becomes a fixture in the house too. Sunita feels sorry for him, having witnessed his wife’s shrewish behavior (he isn’t very nice to her either, to be fair) and she sees how much Kamal loves him. She welcomes him with an open heart and they are soon friends. Then the rot creeps in. 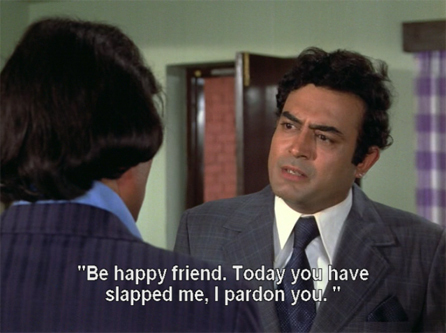 Kamal becomes jealous of his friend, at first only in a joking way. But as the days pass, his suspicions begin to grow (with, I must say, no good reason, which is what enrages me). He catches them *gasp* having coffee together! Mohan stubs out his cigarettes in their ashtray when he is there! 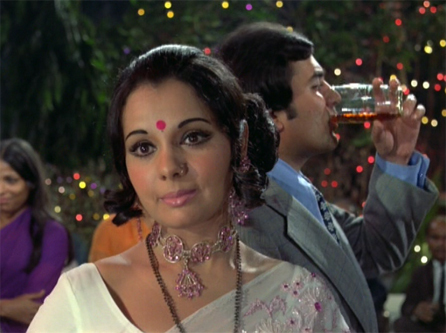 When Mohan throws a welcome party for them, Kamal asks Sunita to sing and she refuses; but when Mohan starts to play his sitar, she is drawn into singing along with him. This really infuriates Kamal, who gets stinking drunk. From then on, he withdraws from her more and more. He behaves, in short, like a spoiled and surly child. Poor Sunita! She has no idea what has happened and he refuses to talk to her, although she reaches out to him tentatively. Then one evening as he arrives home, he spots a man leaping over the wall between their house and Mohan’s, and he snaps. 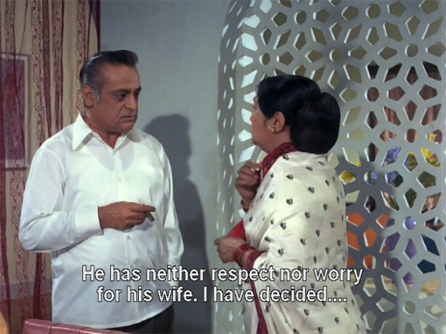 He accuses Sunita of “providing the love” that Mohan doesn’t get from his wife. As his behavior is finally explained, Sunita is furious (I cheer—she doesn’t fold up and die, but gets good and mad—yay Sunita)! She angrily refuses to dignify his suspicions with any answers. She packs her bag and goes home to her parents, where she finally breaks down. Mohan comes to see Kamal that same evening and Kamal voices his accusations again and slaps him. Mohan is hurt, but more magnanimous than Sunita. Kamal pays no heed to Mohan’s protestations of innocence. Sunita’s father (Rehman) also comes to try and talk sense into Kamal, but again, he refuses to listen. When he returns home, Sunita’s mother (Dina Pathak) is persuading Sunita to go and talk to Kamal. 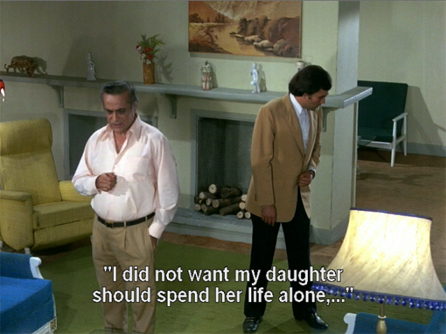 Sunita herself doesn’t want to give up on Kamal yet, but her father furiously forbids her to go. I love love love Rehman, but now I am enraged again. Who made him the decider? Why doesn’t Sunita get to control her own life? She follows her father’s diktat, though. Mohan comes and asks Sunita to tie a rakhi on him to help convince Kamal of their innocence, but her father rebuffs that idea too. He sends a divorce notice to Kamal in an attempt to make Kamal come to them, but Kamal calls his bluff and the divorce goes through. Sunita is heartbroken, her life in ruins—thanks to all that male pride! She is hospitalized from the stress. Months pass, and then again one evening Kamal sees a man jumping the fence between his and Mohan’s property. He gives chase, and catches Suresh (Ranjeet)—a fellow employee and friend. Suresh admits that he’s having an affair with Mohan’s wife, and tells Kamal that he set fire to his own house with his suspicions about Sunita and Mohan. Repentant, Kamal asks forgiveness first from Mohan, who gladly grants it. Then he goes to Sunita’s house, where he receives shocking news. Sunita’s father has gotten Sunita remarried, despite reluctance on her part. He is heartbroken, but you’ll have to watch to find out what happens to him. When the film ended, I rolled my eyes at my sister and said “What a terrible movie.” She said, “Yes, but he was good in it.” And in fact it wasn’t a terrible movie; I guess for its time it even had a somewhat liberated message—just not quite liberated enough to make me happy. Plus, I hate sad endings. I was severely annoyed by Kamal’s stupidity and childish jealousy, and Sunita’s father’s stubbornness and patriarchal interference. The screenplay took the marriage from bright and happy to troubled and dark a little too easily for my liking, too, but Khanna did his best to transition his character with more shading than the script really gave him room for. I enjoyed his performance, and his chemistry with Mumtaz. She and Sanjeev Kumar were great support for him too. Posted on August 18, 2008 at 4:43 pm in Hindi movies	| RSS feed You can skip to the end and leave a reply. I know! and Ranjeet wasn’t a villain in this (although he was an adulterer and Eve teaser ;-) I wouldn’t have wasted good pie, but I did want to throttle Kamal for a while. I loooooved the fact that Sunita got married off to someone else instead of waiting for him and then forgiving him! :-) And I’d forgotten about Rehman being in the movie – he looks pretty good in the screencaps. I never liked Rajesh Khanna much except in Anand.He has an uncontrollable tendency to ham.Mumtaz is easy on the eyes though. Hey Memsaab, I am amazed to see such a brilliant blog dedicated to my fav. era in Bollywood. I really loved the way you discuss these 70s films here. Hope you wont mind me adding your blog to favorite bloggers list on my blog. Madhu: all the songs were great, I loved the picturization of Jai Jai Shiv Shankar though—Rajesh seemed to be enjoying himself so thoroughly. But Zindagi Ke Safar is lovely lovely lovely. Alok: Welcome :-) I love Banno’s blog, and am glad you found your way here! Am I glad you’ve reviewed this ! Seeing that you’ve recently started reviewing some Rajesh Khanna movies, I was looking for an opportunity to tell you about a certain documentary I have. This is the famous BBC documentary ‘Bombay Superstar’about Rajesh Khanna. It was made in 1973 just around the time of his marriage to Dimple & when his superstardom was starting to wane a bit. It is a fascinating watch & the shooting of this particular movie features heavily in it, so a good place to post these comments. It has some interviews with Mumtaz & the Director of ‘Aap Ki Kasam’, J Om Prakash (Hrithik Roshan’s grandad). The picturisation of the song ‘Suno Kaho’ in Kashmir is also shown in detail. Hi Pavitra! I’ve sent you an email; I know there are lots of people who’d love to hear more about this documentary. Very good review on our Super Star Rajesh Khanna movie Aap Ki Kasam. 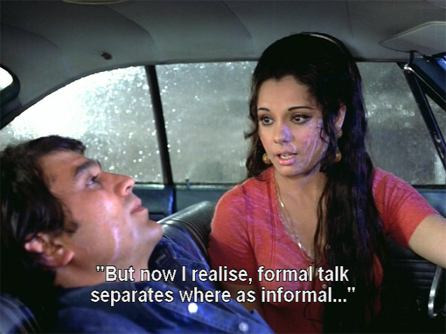 Its sparkling chemistry between Mumtaz and Super Stra Rajesh Khanna, this is a moving human drama ever made. This was another movie that I got after reading your review… I’ve just watched it, and I’m really glad I got it. Loved ALL the songs, and Mumtaz looked absolutely gorgeous. Also really enjoyed the chemistry between her and Rajesh and all the adorable newlywed romance between their characters – until the insane, stupid, mindless jealousy sprang up and ruined things! Although Kamal was a stupid dumbass and a childish PRAT, Rajesh Khanna did a really good job with his handling of the character and made him less two-dimensional than he could have been. I think his performance was really, really good. 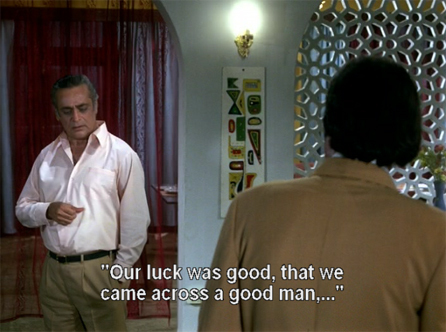 Loved Mumtaz and Sanjeev’s acting in this as well. They were fantastic. I felt about it exactly the way you do! So—not a whole-hearted recommendation, but there was a lot of good to enjoy in it too. And pretty…(don’t forget my boyfriend Ranjeet who is totally hot—and not really a villain—although he’s not in it enough)…I’m glad you enjoyed it! The review by you is very good and logical too. Yes, Rehman’s stubbornness played a negative role in the patch-up of the broken couple. However please appreciate that it was a path-breaking movie of its time because unlike the traditional Hindi cinema, the heroine does not go back to the shelter of her husband’s feet. By default, an average movie became a memorable movie. Still watchable and appreciable because the main point – ‘never allow suspicion to eat up your relationships’ is infinitely relevant. I know most of the people have felt that Rahman took a decision on behalf of his daughter but I remember him telling Kamal that he saw his daughter in such a dishevelled state that he had no choice. This revelation that she has got married again comes as a shock to the audience. This strange twist in the movie contributed to the superhit status of this movie. Music and songs were awesome – especially the lyrics of ‘Zindagi Ke Safar Mein’. As a father Rahman was not convinced that Kamal could have changed so fast and so to avoid a recurrence of a similar plight for his daughter, he has got her married off. You remember the final scene in the movie where there is a fire. In reality, there was an actual fire and the actress who played Mumtaz’s duaghter luckily escaped. she was a marathi actress – can’t recollect her name, she even appeared in a few TV serials later on.yes, her name was priyadarshani. Mumtaz’s acting in the climax was really excellent especially in the scene when her first husband tries to touch her feet. From where do u actually get these pictures from? with the subtitles!? Did Rajesh Khanna die in the end with a heart attack? I forgot how this movie ended. Does Rajesh Khanna die in this movie too? I recently got this DVD (Shemaroo) and yesterday, saw the movie. You are right about the ‘you’ being ‘U’ – I really didn’t appreciate it… However, I loved the movie, even though the ending is not exactly to my liking. My initial contempt of Kamal turned to pity on seeing his repentance and (justified) punishment. I just love the Rajesh Khanna – Mumtaz combo (in my opinion, one of the best looking pairs in the Hindi industry). And what an amazing collection of songs!! My favorite is Suno Kaho, though I love ALL the songs. Rehman, too, is very good looking – I am a great fan of his! It also felt strange to see Ranjit not getting hammered towards the end!! One of the reasons why I kept this movie at the end of the queue of my RK movie marathon since his death, was the stupid ending which I still remembered from my teen days. I had forgotten that rest of the movie is so good. No need to say anything about Rajesh and Mumtaz romancing each other. They love it, we love them doing it. Great songs, great picturization, lovely scenery, lovely couple. I personally don’t think Mumtaz quite matches up to RK in emotionally intense scenes but love her anyway! Thank you Memsaab for pointing out how RK went for challenging roles without thinking of his image even at the top of his career. Did not appreciate him enough for that but now I do. Really really loved his take on the jealous husband, and unlike others, I do not think those were stupid reasons, having seen this happen in real life! I was fine with Mumtaz remarrying, but Rajesh drifting homeless for 18-20 years ( the daughter getting old enough to get married) and the end was beyond my acceptance level. I can watch ‘Jai Jai Shivshankar ‘ over and over just for the great chemistry between these two! There is a scene in the film where kaka slaps sanjeev. Seems kaka was so incensed with sanjeev being close to anju mahendru, that he gave a stinging slap in that take. Sanjeev felt hurt & the two were not in good terms. In fact, he was the first choice for alag alag but he refused kaka’s offer & the role then went to shashi kappor who played tina munium’s uncle. 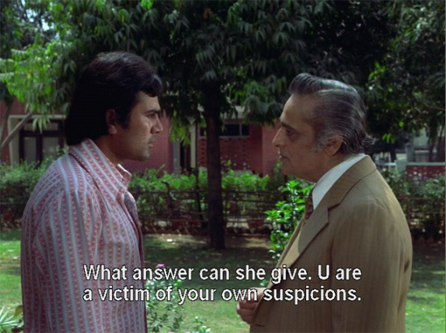 my sister holds this movie,omkara and hum tumhare hai sanam as the greatest example of what suspicion can do to a marriage! I remember this movie for its great songs and glorious cinematography. RK and Mumtaz were gorgeous but the movie made super depressed. The ending was sad and some what stupid. Specially RK’s old man get up was just too fake. I only recommend the first Half of the movie. Stop watching soon as the over preachy zindigi Ke suffer mhe guzar song starts! My Life is also going on same track and I can understand Kamal’s mentality. Saw this movie last night. Like everybody else here I simply loved the songs and the picturisations. Rajesh and Mumtaaz (plus all the other dancers) seem to have had a ball doing the jai jai shiv shankar number. Rehman has been one of my favourite actors since i was 8 years old! (A family friend took us kids along for a re-run of his old movie choti Bahen as he had free passes). As a 8 year old I felt he was a gentle and nuanced actor and this continues to this day when i see him in his later movies even in short roles. His subtle gestures as the suffering father in Aap ki Kasam esp in the scenes where he silently signals to Dina Pathak when mumtaz comes home distressed are some more example. As some one else has pointed out above, Rehman does explain his decision to his wife that he can’t see his daughter being happy with Rajesh again after going through so much shock and grief. Even when Rajesh comes around later seeking forgiveness he asks Rajesh – what would he do as a father if something similar happened to his daughter ie getting mumtaz married again. Rajesh admits that it was a good decision as a father and he would have done the same. Of course, watching the movie nearly 40 years later, we all the feeling that Mumtaz should have been given a choice in going back to Rajesh. But then she does not cool down after her angry outburst at his lack of trust in her which is justified. If there was a chance of her trying to set things right, it would have been when she is still with him but as we see Rajesh is in mood to even listen to anyone about his misconceptions. AAP KI KASAM was somewhere around JULY/AUG 1974 as to best of my rememberence,those days since I was class Fourth student,as such to us during those days,KHOTE SIKKAY,36 GHANTE,GADDAR,rest all those action beholded more prominence for us,but when I Grewup saw this movie once again,I understood,not only this movie had one of finest musical score,which every song was hit,but even content was with such great relevance,that even it beholds you,superlative performances by three major players,not to forget SANJEEV uncles underplayed/subdued performance,Herein I Remember a comment by respected J.OM PARKASH JI,somewhat surprising,and he wrote,that personaly he was not happy with music of his three movies,namely RAJA RANI(1973)AAP KI KASAM(1974)and AANDHI(1975)all three by legenedry R.D.BURMAN DA,and it can be heard even today fourty years after there release.THE basic idea was that sometimes even small/minute misunderstanding is resolved in ones lifetime,so before jumping to any conclutions,think twelve times,it also remineds me of another movie though thatone was 1976(DO ANJANE)where I Personaly I Believe the ending was comprised,though the circumstances it was chaged if at all,they must be with REKHA aunty/AMIT uncle,I Hope RAJESH uncle now in another world must be in peace/happiness.RAVINDER MINHAS,JALANDHAR CITY,PANJAB,minhas35@yahoo.com. Excellent review. Great cast as well. As much as we would all like to be rational, our emotions can get the better of us. Johanthan Haidt, author of ‘The Happiness Hypothesis’ describes each of us as sitting on top of an elephant. The person on the elephant is our rational mind and the rest of the elephant is the bundle of our emotions and instincts. The rider thinks he is in control of the elephant – but in reality can do nothing if the elephant decides to go berserk. With that in mind, we can disparage Rajesh Khanna’s character for his stupidity (of course) – but the story gives room for his emotions to play out and its disastrous consequences. I like happy endings too. But the story was logically concluded within its construct. I would hope you agree?